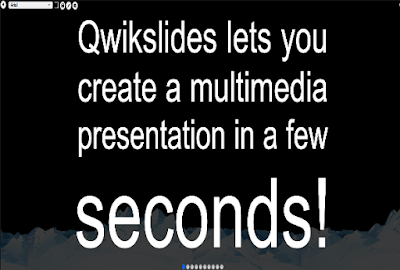 Qwikslides is an excellent web tool from Classtools that allows students to create beautiful multimedia presentations and timelines to use in class. No registration is required, students launch the tool and start working on their slides right away. Presentations can embed a wide variety of multimedia materials including text, images and YouTube videos. Students can customize the background colour of their slides, change text font and embed their final product in a blog, wiki or website. Quikslides' presentations work across different devices and platforms. They are also touch-device enabled. The process to create a presentation or timeline in Qwikslides is very simple: Launch the tool, click the edit button at the top of the screen and start filling in your data. Each line of text you write becomes its own slide. To embed a YouTube video or an image, copy and paste its URL address in the editor. Use the top left menu to change text font, background colour, and save your work. To save your presentation, you will have to provide a password in that way so you can come back and edit your presentation anytime you want. Watch the video below to learn more about Qwikslides.